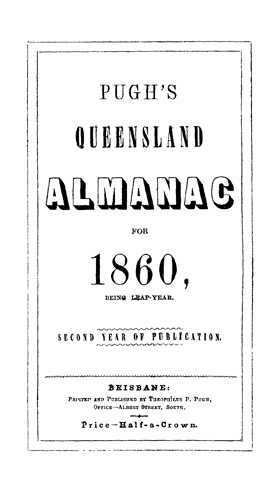 This Pugh’s Almanac and Queensland Directory contains Brisbane and country towns directories which lists the names and professions of many people in Queensland as well as information on routes, stations, and distances. It also includes a comprehensive almanac section giving information on weather, events, history of the colony, the government and more. Directories are an extremely useful tool for establishing when and where a person lived. However this is just a starting point. Look further in the directory to find out more information about the society in which they lived, the occupations they held and the people they knew. Some editions contain a Brisbane directory as well as a country directory. The Brisbane directory lists the occupations alphabetically with names and street under each. The country directory lists the towns as well as stations, and station-owners. In addition it includes details on over 40 other areas. Everything from eclipses and newspapers, to postal information and the Works Department is covered, as well as numerous advertisements. Included in this collection are all volumes covering the period of 1860 to 1927. They're a valuable guide to the people, places and social history of Queensland, and perfect for anyone exploring their family history or building a family tree.